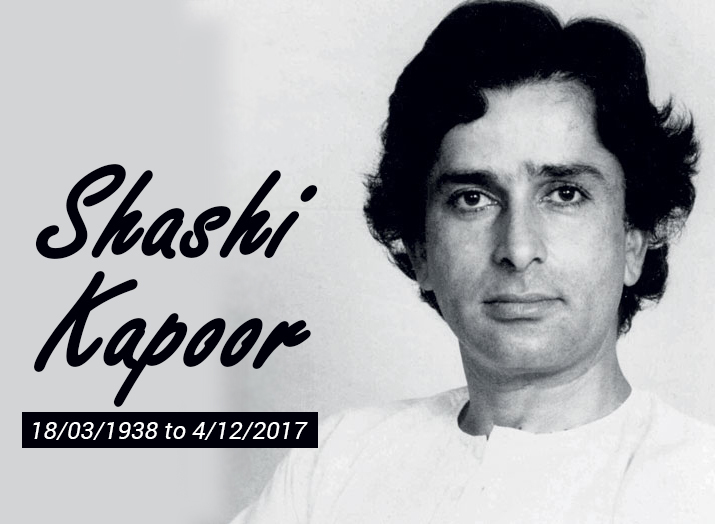 The iconic star of 60’s & 70’s Mr. Shashi Kapoor is no more with us. After many rumors of his death in the last one year he finally bid adieu to the world. In my growing years he was not a star to be known by our generation but early introduction to cable TV network took me to his cinema. He was among the handsome male actors of his time who enraptured the cinema goers of his time with versatility of his characters in the movies like Jab Jab Phool Khile, Dhram Putra, Satyam Shivam Sundaram, Deewar, Suhaag, etc. Who can forget calm and composed Ravi in front of angry Vijay answering all questions with just a phrase ‘Mere Paas Maa Hai’. I think most of us will remember him always by this scene. It is difficult to remember his larger than life roles in his films of heroism but we can’t forget him in movies like Satyam Shivam Sundaram, Jab Jab Phool Khile, Sharmeeli, Namak Halal, Suhaag, Shaan, Kabhi Kabhi, Aa Gale Lag Ja, Chor Machaye Shor, Kala Patthar, etc. He was also admired for keeping alive the Prithvi Theater by continuously working in it. Even in his last years he was keen to see plays acted in it. He even directed many films which were critically acclaimed like Utsav, 46 Chowrangee Lane, etc. These films didn’t much succeeded in box office but to him they give creative satisfaction. He also acted in English films which was a rarity in the time he was active. He started as a child artist in his brother Raj Kapoor’s Awara and enjoyed working throughout his career. He was comfortable doing second lead or supporting actor’s role and did commendable jobs in many films with Amitabh Bachchan, Deewar, Suhaag, Namak Halal, Shaan to name a few. His friends and co-stars remembered him as simple, polite and big-hearted gentleman and whatever I have read and seen about him I too believe he was a no tantrum star even when he worked with his juniors. In 2015 he also received the Dadasahab Phalke award which is the highest honor given to a film actor in India. You will always remain in my memory as a jovial star RIP Shashi Kapoor Ji. A good tribute to Late Shashi Kapoor. May he rest in peace. A fitting tribute to Shashi Sir who played an important role to script the changing face of cinema and was the first of our cross over actors. He was a blend of depth acting in both commercial and art cinema. His contribution to theater is worth gold and hope his daughter Sanjana keeps the momentum going with Prithvi theater which is a rich legacy.